To celebrate the Spring release, Stampotique invites you to link up your best Stampotique projects to be considered for use within the Stampotique.com web site (as samples and examples). Favorites will be featured in the slideshow on the front page of the Stampotique.com gallery and there will be a random draw for $30 to spend in the Stampotique store on May13th! Can't wait to see your projects! 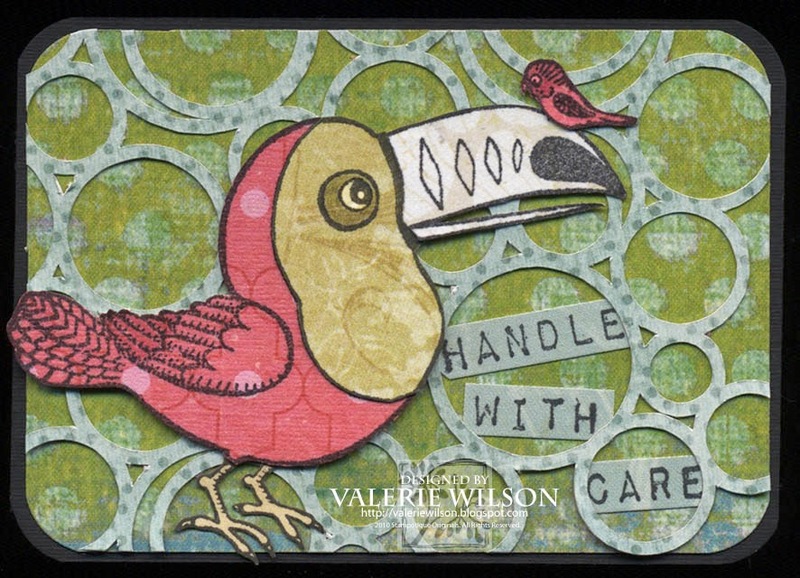 Here's my latest little ATC creation made entirely from the scrap pile and featuring one of the brand new barcode sentiments and a paper-pieced, ever-adorable toucan and budgie. The circle layer was cut with my Silhouette.